In his recent two-day visit to Kyrgyzstan, Turkish President Recep Tayyip Erdogan continued to exert pressure on Bishkek to take action against the Gulen network, which Ankara accused of staging a failed coup in July 2016. U.S.-based cleric Fethullah Gulen, once an Erdogan ally, is the loose center of a sprawling, amorphous social network. Gulen founded a movement which has, among other things, built and staffed hundreds of schools around the world, including in Central Asia where the schools filled a critical gap left by the collapse of the Soviet Union. Kyrgyzstan renamed the schools but didn’t shut them. Two years later Atambayev is out, Jeenbekov is in, and Turkey is still trying to pressure Kyrgyzstan into shutting Gulen-linked schools and organizations. The network of Turkish schools in Kyrgyzstan, known previously as Sebat lyceums, were renamed and reregistered last year, but they were not closed as has happened in Tajikistan and Turkmenistan. Kazakhstan responded in a similar fashion, renaming schools but not shutting them down. At the time, Jeenbekov did not respond directly, only emphasizing his desire for closer relations with Turkey. Erdogan’s recent foray to Kyrgyzstan included a meeting with his Kyrgyz counterpart, attending a Kyrgyz-Turkish business forum, the opening of a new mosque and a visit to the Kyrgyz-Turkish Manas University for the ceremonial opening of a new medical department, as well as a summit of the Turkic Council and an appearance at the opening of the 3rd World Nomad Games. Jeenbekov in turn emphasized that the schools were under government control and have an excellent reputation. As Chris Rickleton noted in an article for Eurasianet, Erdogan managed to slip a reference to the Gulen network into nearly all of his public appearances. Turkey continues to hammer at the Gulen issue and Kyrgyzstan continues to hedge, balancing several important concerns. First, the Gulen schools are critical to Kyrgyzstan’s educational system, which remains weak in significant ways. For example, a new school in Kyzyl-Ozgorush in southern Kyrgyzstan was constructed in 2010, but could fit only 120 students, leaving 600 to use the old school, built in 1957. Last year, the crumbling old school was declared unfit for use and students began classes in yurts, a situation that persists in the new school year, RFE/RL reported recently. Second, and this follows the first point closely, Gulen schools have operated in Kyrgyzstan successfully for more than two decades. These schools have meaningful domestic constituencies, from former students to the parents of current students. Third, a good working relationship with Turkey is important for Kyrgyzstan’s economy. While Kyrgyzstan’s trade volumes with Turkey fall behind Kazakhstan, Russia, and China in particular, Turkey remains an important economic partner. Jeenbekov said that the bilateral trade volume between Kyrgyzstan and Turkey was around $356 million, with their eyes set on crossing an ambitious $1 billion one day. And lastly, one cannot discount the role domestic politics plays in how a state conducts its foreign policy. 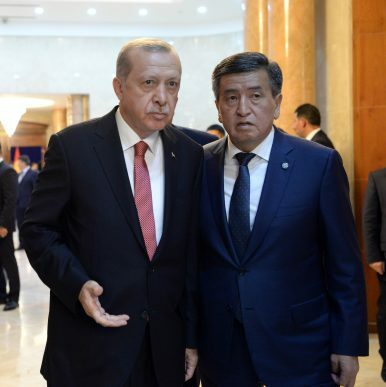 Jeenbekov’s public split from Atambayev gave the new president an opportunity to at least deal cordially with Erdogan. Jeenbekov may not ultimately bend to Erdogan’s demands, but he hasn’t insulted Turkey outright like Atambayev did. Thus Jeenbekov operates from a stronger position vis-a-vis Turkey than Atambayev had. For now, Jeenbekov is maintaining the balance: refraining from antagonizing Turkey by rebuffing its insinuations of a pending Gulen-sparked coup while also not antagonizing domestic supporters of the Gulen schools by leaving them open. How far is Turkey willing to go to tip Jeenbekov into action along Ankara’s desired path and how strongly is Jeenbekov willing to resist Turkish pressure? Kyrgyz President Jeenbekov did not respond directly to Erdogan's urging to deal with Gulen-linked institutions. Another Atambayev Ally Faces Corruption Charges in KyrgyzstanThe Bishkek Power Plant Saga: Former Kyrgyz Prime Minister Faces Corruption ChargesKyrgyzstan: Power, Prime Ministers, and Power PlantsNew Charges Levied Against Former Kyrgyz Presidential CandidateWill Kyrgyz Democracy Pass Its Next Test?